“In the first chapter of the Gospel of Luke, the angel Gabriel appears to a young girl named Mary, who lives in the small, backwater town of Nazareth. The angel announces the birth of a son, to be named Jesus. Not surprisingly, Mary is at first fearful and then doubtful. “How can this be,” she says, “since I am a virgin?” In response, the angel offers an obscure answer. “The power of the Most High will overshadow you.” Then, as if to remind Mary of God’s power, he says, in effect, look at what God has already done. Her cousin, Elizabeth, is already pregnant, says the angel, even though the elderly woman was thought to have been unable to conceive. “For nothing will be impossible with God,” says Gabriel. May 28, 2018 On this Memorial Day, we pray for the brave men and women who served our country and are no longer with us. God of power and mercy, you destroy war and put down earthly pride. Banish violence from our midst and wipe away our tears, that we may all deserve to be called your sons and daughters. and bring them safely into your kingdom of justice and peace. On this Solemnity of the Most Holy Trinity, we reflect on these words from Pope Francis about the trinity, the “divine family” of God, the Son, and the Holy Spirit. The word “Easter” comes from Old English, meaning simply the “East.” The sun which rises in the East, bringing light, warmth and hope, is a symbol for the Christian of the rising Christ, who is the true Light of the world. The Paschal Candle is a central symbol of this divine light, which is Christ.It is kept near the ambo throughout Easter Time, and lit for all liturgical celebrations. 22. The fifty days from the Sunday of the Resurrection to Pentecost Sunday are celebrated in joy and exultation as one feast day, indeed as one “great Sunday.” These are the days above all others in which the Alleluia is sung. I thought I would share a few different prayers of Thanksgiving. Once again, we mark the month of October as Respect Life Month. Looking back over the last year, there’s been a lot of uncertainty, suffering, and heartache. Between tragedies that occur in the public eye and trials that take place in our personal lives, there’s no shortage of reasons we cry out to God. At such times, we may feel alone and unequipped to handle the circumstances. But we have an anchor of hope to cling to. With words that echo through thousands of years into the corners of our hearts, God says to us, “Do not fear: I am with you” (Isaiah 41:10). The 2017-2018 Respect Life theme, “Be Not Afraid,” reminds us of this promise. God isn’t a detached, distant observer to our pain; the Eternal Son became man and Himself experienced immense suffering—for you and for me. His wounds indicate the very essence of our identity and worth: we are loved by God. There are times we may doubt the value of our own lives or falter at the thought of welcoming and embracing the life of another. But reflecting on the healed wounds of the Risen Christ, we can see that even our most difficult trials can be the place where God manifests his victory. He makes all things beautiful. He makes all things new. He is the God of redemption. That’s powerful. That’s something to hold onto. And, He is always with us. Jesus promised this when he gave the disciples the same mission he gives to each of us: Go. As followers of Jesus Christ, we know that our identity and our mission are two sides of the same coin; like the apostles, we are called to be missionary disciples. We are not only invited to follow and take refuge in God, our stronghold, but we are also commissioned to reach out to one another, especially to the weak and vulnerable. Building a culture of life isn’t something we just do one month of the year, or with one event or initiative—it’s essential to who we are. It happens through our daily actions, how we treat one another, and how we live our lives. How do we respond when our aging parents are in failing health? Do they know how much we love them and cherish each day given? Do we ensure they know they are never a burden to us? In our own challenging times, do we ask for support? When others offer a helping hand, do we receive it? When our friend becomes pregnant in difficult circumstances, do we show compassion that tangibly supports her and helps her welcome the life of her new little one? Sometimes, we may not be sure exactly what to do, but let’s not allow the fear of doing the wrong thing or saying the wrong thing keep us from living out our missionary call. We don’t need to have everything figured out all at once. 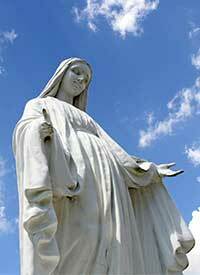 Let’s remember the guidance of Our Blessed Mother, the first disciple: “Do whatever he tells you” (John 2:5). Also, I encourage you to visit www.usccb.org/respectlife to see the U.S. bishops’ new Respect Life materials centered on the theme “Be Not Afraid.” There are articles, bulletin inserts, prayers, action ideas, and more! This Respect Life Month and always, let’s walk with each other; let’s help each other embrace God’s gift of human life. Whatever storms or trials we face, we are not alone. He is with us: “Behold, I am with you always, until the end of the age” (Matthew 28:20). The following links are to articles published by the United States Council of Catholic Bishops on the website www.usccb.org. Call the National Domestic Violence Hotline: 800-799-SAFE (7233) – 24 hours, toll free or visit the National Domestic Violence Hotline for more information. Please check out the Catholic Families for Peace website for more information. If you or someone you know is suffering after abortion, confidential non-judgmental help is available. Call Project Rachel’s national toll-free number: 888-456-HOPE(-4673) or visit HopeAfterAbortion.org. Or visit www.buffalodiocese.org/pro-life or call Project Rachel’s Buffalo office at (716) 847-2211. 10/7/2017: This weekend please take a few moments in prayer and reflect upon your week and try and pinpoint a few moments that may have been stressful, difficult, maybe even mundane or boring, and looking back on those moments,consider how they may have been blessings or may have bore fruit had we approached them differently. Starting this Saturday, in response to Pope Francis’ call to care for the Refugee, the USCCB, CRS and Catholic Charities U.S.A have initiated a week of prayer and action to “Love Your Neighbor” especially the many refugees in our world. This initiative is called Share the Journey, under the hashtag #Sharejourney. Here is the link to the webpage with practical suggestions and prayers for the week, showing ways that we can help refugees and those displaced in our country and world: https://www.sharejourney.org Please take a look at this website and especially pray this week for those suffering from the injustices of our world. I am drawn to think about the Holy Family and how they themselves were refugees. How the angel came to Joseph in a dream and called him to take his family to Egypt to avoid the scourge of infants under King Herod. Can you imagine Joseph, bringing with him the two most Holy and influential people that have ever walked the Earth and fleeing to an unknown land? What an example to us about obedience and trust in the Father’s will! We know very little of that time in the life of the Holy Family, but how crucial to the salvation of the world that they would experience a flight into safety. May we be a people whose prayer affects the way we live our lives. May we strive to love our neighbor as Christ loves us and we love ourselves. Have a fun, safe weekend! I look forward to seeing you all next week!